Paper Boat Race is a novel racing game where you race paper boats around a pool—by blowing into your iPhone’s microphone! 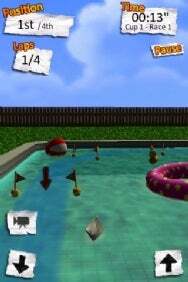 Developed by I-Play, this 3-D racing game features adorable paper boats, beachballs, and other trappings of your typical pool. While the game has its moments of nerdy joy, blowing into the microphone while trying to control the boat is hard to do—and there’s really anything else going for the game. Racing your paper boat is fun for the first few minutes, but the controls hold back this game. To play, simply guide your boat along the swimming pool racetrack by blowing into the microphone and using the accelerometer to steer. While this is a really cute idea, it’s unfortunately not as cute when put into practice. Since the iPhone’s mic is located on the bottom of the phone, you have to hold your iPhone parallel to the ground, blow into the mic, and try to look down as you tilt your boat through the course. This is not impossible, but also not terribly easy on the eyes. Luckily, there are alternative controls—you can tap the on-screen buttons to go backward and forward at a fairly steady speed, and if you need a boost you can simply blow once into the mic. The tracks are marked with flags, and you have to guide your boat between the successive sets of flags in order to complete a lap. A nice touch is that if you miss a set of flags, you can just aim your boat at any other set of flags and you’ll automatically be placed in front of the flags you’re supposed to go through. There’s a practice mode, an arcade mode with four championships (five races each), and a quick race mode. There’s no online or local multiplayer, which is disappointing (the game isn’t quite exciting enough to hold up as a single-player game), but Paper Boat Race does incorporate OpenFeint statistics and leaderboards, so you can see who’s better at blowing boats than you are. The graphics are a little blocky, but I like some of the design choices. I appreciated that the buttons of the game are represented as pieces of paper and the music is terribly cheery. The artwork (including the paper waves on the opening screen) is cute and adds to the novelty of the game. Paper Boat Race is a cute, simple racing game that will take you a decent amount of time to master (paper boats on a pool are harder to control than you’d think). However, the idea of blowing into the mic to fuel the boats, while novel, is not terribly convenient—and gets old pretty quickly. It’s a good thing the developers thought of the potential eye strain and added buttons, or the game wouldn’t be playable for more than five minutes. Overall, it’s a cute game, but not really worth the $1.99.